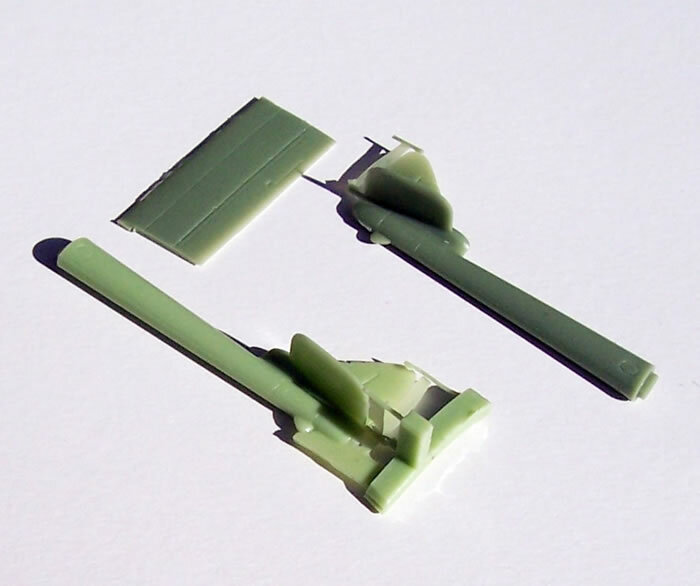 49 x green resin airframe parts, 7 x black resin undercarriage parts, 1 x Eduard coloured photo-etch (PE) fret of detail parts, 2 x vac-from acetate canopies & 1 x Eduard pre-cut paint mask, decals for three aircraft. Available online from Hannants for £33.33 and various other CMR stockists. High quality, superbly detailed kit. 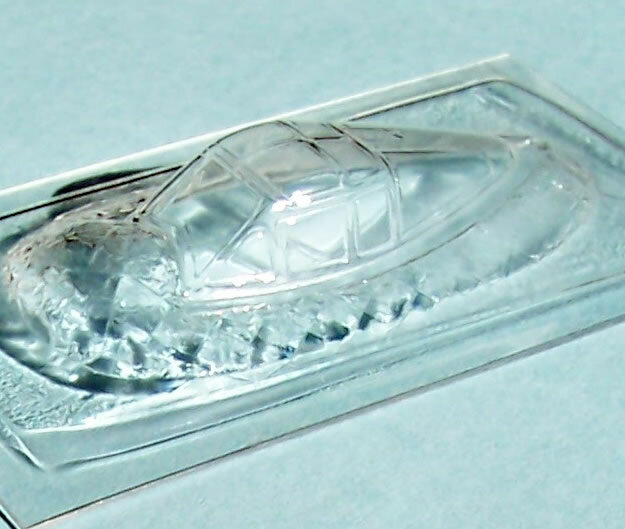 Probably more suited to modellers with some resin and multi-media experience. A superb kit overall. By 1947 the RAF was seeking a replacement for the Mosquito in the All Weather & Night-fighter role. The RAF favoured twin-engined aircraft over single-engined for night operations, so Gloster’s night- fighter version of their two-seat Meteor T.7 trainer was well received. At the same time De Havilland had realised that a two-seat cockpit and nose-section that was similar to a night-fighter Mosquitos could be grafted onto their Vampire FB.5 airframe, the diameters of the fuselages being very similar at the rear of the cockpit. 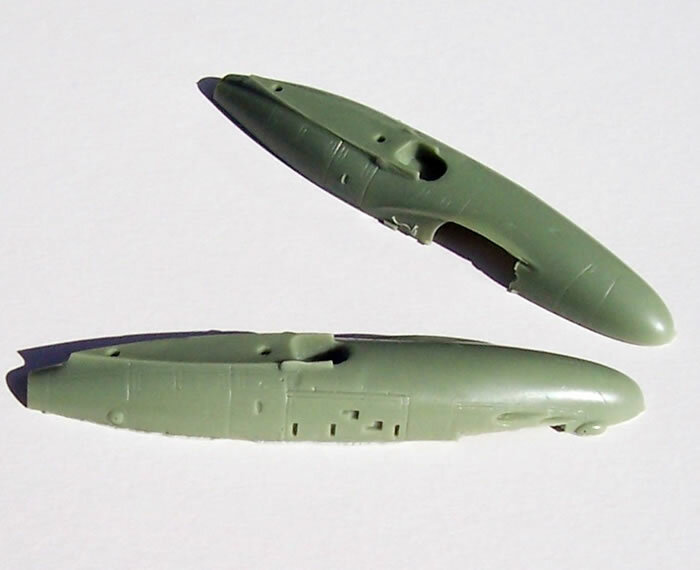 The other shape change was to extend the horizontal stabiliser outboard of the tail fins. These relative easy changes to the FB.5 airframe shortened development time and left De Havilland well placed to meet a burgeoning export demand for jet night-fighters. The Meteor night-fighter production was to be taken up by Armstrong Whitworth because Gloster was fully committed to other work. This slowed its rate of introduction to service, so there did seem an opportunity for the Vampire NF.10 to be procured if the RAF was to avoid continued dependence on the Mosquito. However RAF was reluctant having ordered both the Meteor and more modern DH Venom Night-fighter by this stage (so much for the night-fighter twin engine policy you might think). The Vampire NF.10 was also criticised for lacking ejector seats, but then so did the Meteor Venom night- fighters for that matter, although the Vampire’s better range than both and superiority as a gun platform compared to the Meteor could not be denied. In the end the need to replace the Mosquito with a jet meant that the Vampire NF.10 was accepted for service and 95 built, although its service life was truly stopgap, lasting only two and half years. Some NF.10’s were redesignated NF.10(T)and used to train Javelin radar operators. But this was not quite then end of the story, as the scene was set for the NF.10 design to be developed without radar and optimised for the trainer role. And so it was developed in to the very successful T.11, T.22 Sea Vampire and export T.55, with just over 1,000 trainers in being built in total. 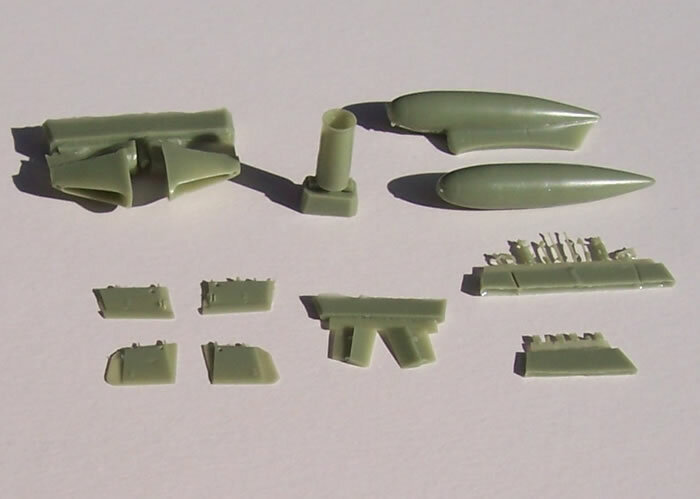 I am unaware of previous Vampire NF.10 kits in 1/72, although Denko made an injected conversion kit for the Airfix FB.5 some years ago. I also know that Aeroclub issued a T.11 kit, so I’d be surprised if they didn’t offer an NF.10 as well. I’m guessing, but given the subject’s appeal to British modellers in particular, and the external similarity of the NF.10 and its trainer developments, I’d be surprised if there were no other kits. Merlin and Pegasus as British limited run manufacturers spring to mind. 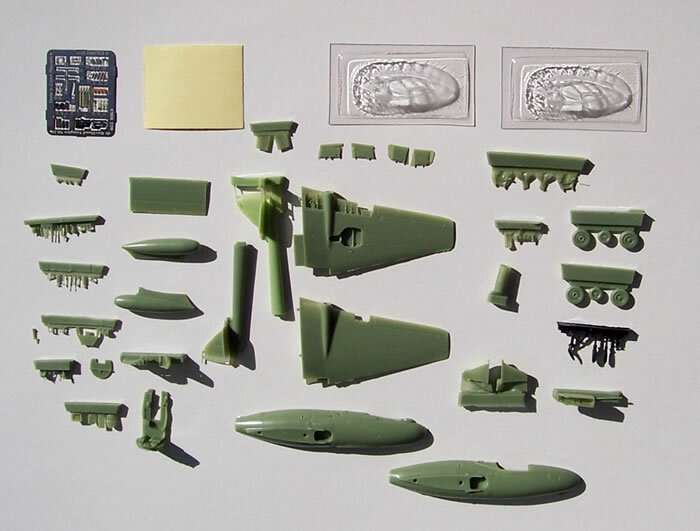 CMR is working its way through all the major Vampire variants in 1/72 scale. 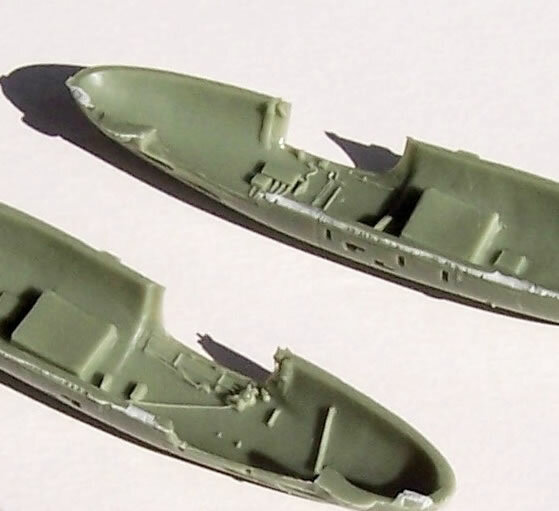 After a marathon effort of releasing numerous single-seaters they have no returned to the twin-seat Vampires (their last being the T.22 Sea Vampire I think about 7 years ago). Judging by its previous releases, CMR seems to be taking the position of offering the definitive version of any given Vampire mark. 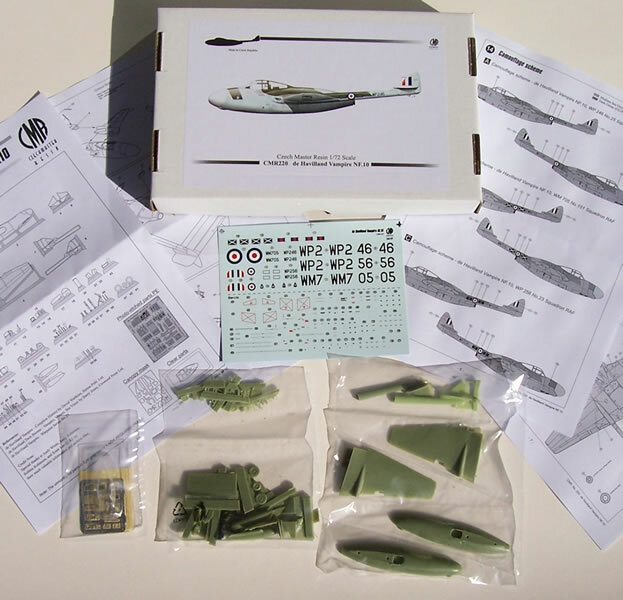 This latest kit follows the established format of the previous single-seat Vampire releases and is described below. The kit comes packaged in CMR’s now standard sturdy top opening box. The parts and decals are in heat sealed plastic bags, which in turn are sealed in a further bag with the instructions. Unlike other recent releases there is no photo-walk-around. The excellent straightforward instructions consist of double-sided A4 pages (see here). The parts map and constructional illustrations are very clear and easy to follow. A double-sided page gives comprehensive colours and markings plans. Colour notes and other written instructions are in English, as is a brief history of the type. 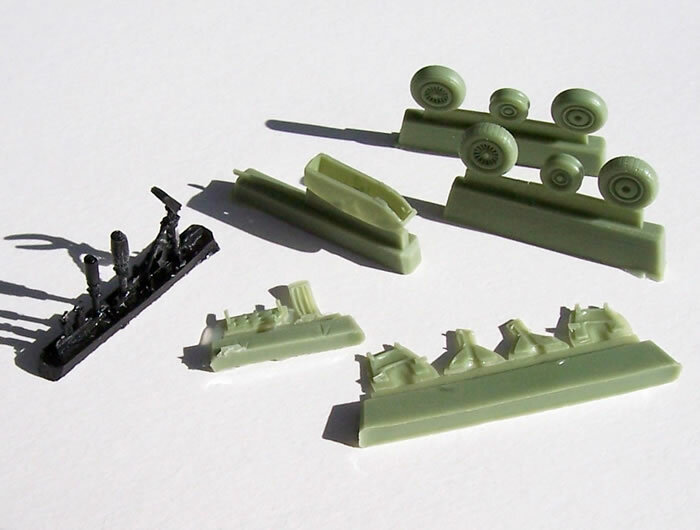 The kit’s resin parts are green rather than CMR’s more familiar cream resin, as this shows up fine detail better. 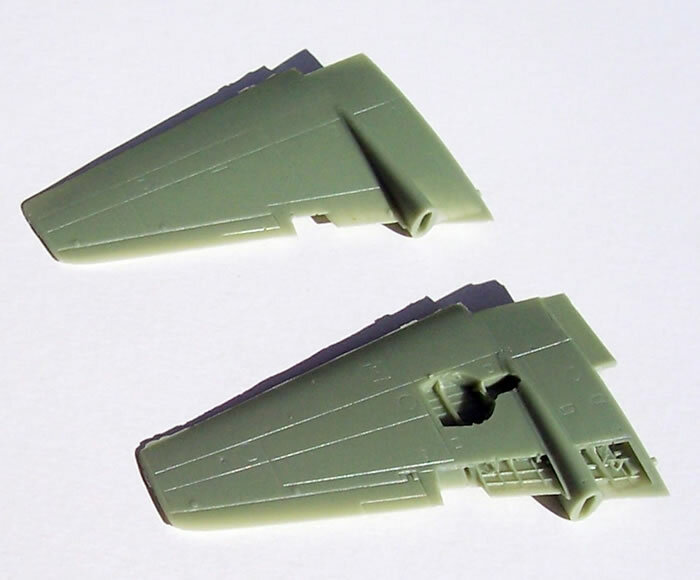 The parts are very nicely moulded with no pinholes or other obvious flaws. A little flash is evident in a couple of places, but this can be removed easily and in seconds. The undercarriage is in a black resin that provides greater strength than the green resin for fine weight-bearing parts, and there is a choice of tyre patterns. WP256 of No.23 Squadron, RAF. This is a superbly executed kit with very high levels of detail and a good choice of underwing loads. 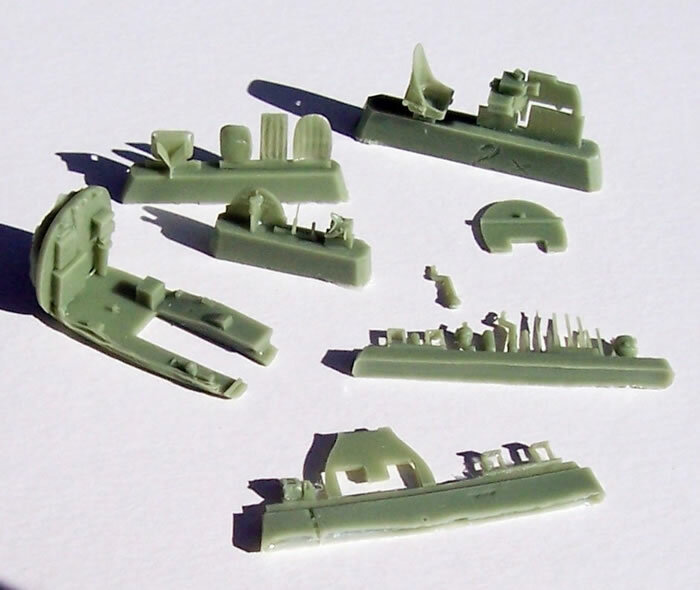 Despite its tiny details and twin-boom layout it should go together in a straightforward manner (I built the CMR Vampire T.22 as my second ever resin kit and it was an easy build). This is surely the definitive Vampire NF.10 kit - Highly recommended.